United Airlines CEO, Other Senior Executives Resign Amid Investigations : The Two-Way The airline is the target of internal and federal corruption investigations regarding possible improper dealings with a former chairman of the Port Authority of New York and New Jersey. 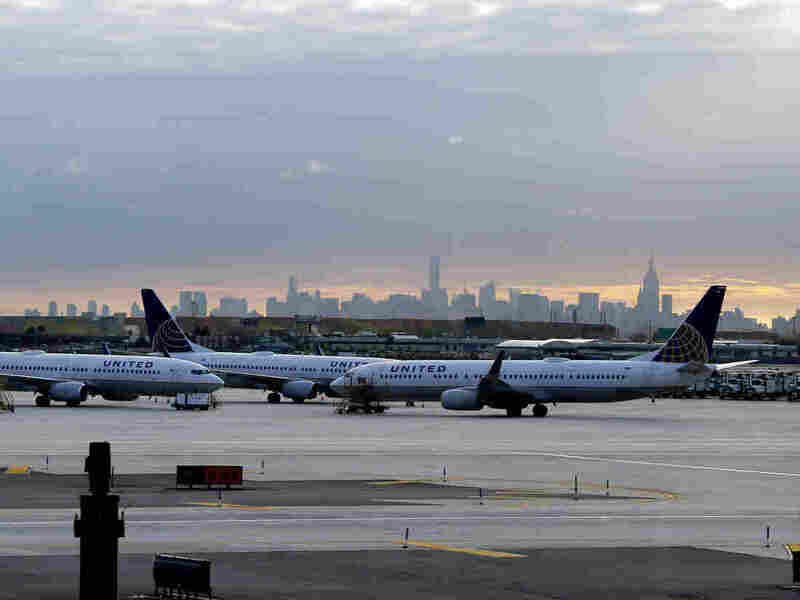 United Airlines jets are parked at Newark Liberty International Airport in Newark, N.J. The United Airlines chief executive officer, Jeff Smisek, and two other high-ranking United employees resigned Tuesday amid internal and federal investigations. "Jeff's departure is in connection with the company's previously disclosed investigation," board member Henry Meyer said in a conference call with analysts, according to Reuters. "United disclosed earlier this year that some of its executives received subpoenas from a federal grand jury for information about its dealings and interactions with the Port Authority. United announced at that time it would conduct its own internal investigation." Most of the suspicion centers on United's relationship with former Port Authority Chairman David Samson. Schaper reports that in addition to requesting documents about Samson's voting record on United Airlines projects, the U.S. attorney's office in New Jersey is looking into United's decision to restart flights from Newark international airport in New Jersey to Columbia, S.C., close to where Samson has a vacation home. "This twice-weekly service started shortly after Samson became chairman and ended a couple of days after he resigned last year," Schaper reports. Samson was appointed Port Authority chairman by New Jersey Gov. Chris Christie in 2011 but resigned in 2014, part of the fallout from the politically motivated George Washington Bridge closures in September 2013. "Smisek was CEO of Continental Airlines since it merged with United in 2010, and he's been steering the giant airline through the merger and all the bumps and bruises along the way." "Smisek is being replaced in the CEO post by Oscar Munoz, who had been president and chief operating officer at the railroad CSX, another very successful transportation company. And in a conference call with analysts, Munoz sought to reassure investors that the company does not expect the investigation to have a financial impact and it will continue to pursue its existing strategic plan."